Take the best routes for trucks and get to your customers safely and on time: Professional navigation is now available especially for trucks. It can do everything that navigation solutions are expected to do – and it even takes trucks' extra requirements into account: Bridge heights and capacities, vehicle clearance heights and truck restrictions. A route created especially for trucks saves time and money right from the start, because it is specifically calculated for trucks and local detours can be avoided. - display of ecotaxe and toll on the road. - truck-resident restrictions can be optionally included in navigation. - PTV Navigator truck is able to recognise when the destination and start addresses are located in areas of blocked access, e. g. pedestrian zones or factory grounds. - in this situation, routing to the destination has been further optimised. - due to the intelligent self- learning mode (ETA), time is calcula-ted on the basis of individual driving behaviour, resulting in a more accu-rate calculation of the time of arrival. Considers closed roads, restrictions and hazardous goods. • The trucks vehicle profile (height, width, weight, axle load, hazardous goods etc.) can be set to the end device at any time. In this way the navigation always takes the relevant road closures or other information (e.g. empty or loaded runs) into account. There is no limit to the number of profiles that can be stored and selected with a click. • The navigation system can alert truck drivers to relevant dangers such as sharp turns, overhanging trees, steep inclines, uneven roads and side winds. • Narrow side roads are automatically avoided to ensure realistic truck navigation. 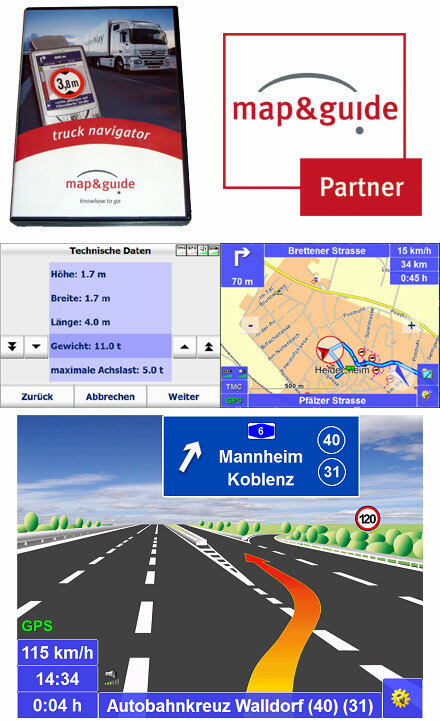 • The map&guide truck navigator route planning automatically avoids residential areas. The truck enters the residential area at the very last moment before reaching its destination. • The driver decides the extent to which narrow side roads and driving through cities is avoided. Different routing profiles can be selected for this purpose. • Turning manoeuvres on unsuitable roads are avoided. • The navigation is able to recognise when destination and start addresses lie in areas of blocked access, e.g. pedestrian zones or factory grounds. In these cases you are also safely guided to your destination. Hatte das 5.0 habe jetzt auf das 7.0 umgestellt, läuft noch nicht alles ganz gut aktuell werden keine Strassenbezeichnungen angezeigt hoffe es wir ein update folgen um diesen Fehler zuberinigen!! Enttäuschend!! Nach meinem Lob beim damaligen Kauf des TruckNavigator 6.0 kommt jetzt die Ernüchterung. - in der 3D Ansicht sind jetzt die Truckattribute (Durchfahrtshöhen, Gewichtsbeschränkungen, etc.) NICHT mehr sichtbar !? es muss umgeschaltet werden in 2D kleinste Ansicht. So ist eine Orientierung bei plötzlich auftretenden Einschränkungen natürlich denkbar schwer.